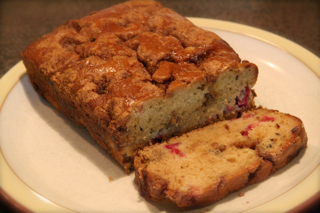 A friend of mine surprised me with a loaf of this TASTY rhubarb bread. He and his wife have replaced the rhubarb with apples and 1 teaspoon of cinnamon as a recipe alternative. He brought in a couple slices to share and that too was excellent. I asked him for the recipe he handed me a print-out from the All Recipes.com website. Enjoy! Preheat oven to 340º F.
In a large bowl, mix together 1 1/2 cups brown sugar, oil and egg. Combine the flour, salt and baking soda, stir into sugar mixture alternately with the milk mixture just until combined. Fold rhubarb and nuts. Pour batter into prepared loaf pans. In a small bowl, combine 1/4 brown sugar, cinnamon and butter. Sprinkle this mixture over the unbaked loaves. Bake in preheated oven for 40-45 minutes, until a toothpick inserted into center of a loaf comes out clean.